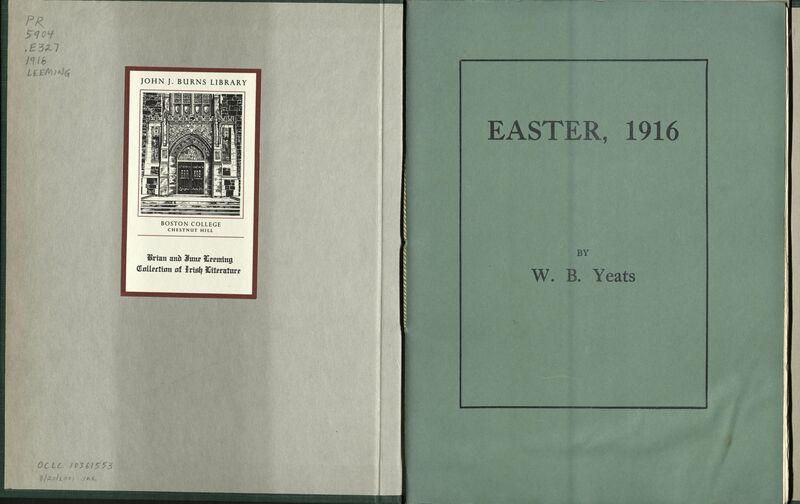 Front cover of Easter, 1916 by W. B. Yeats, PR 5904 .E327 1916 Leeming, John J. Burns Library, Boston College. First page from Easter, 1916 by W. B. Yeats, PR 5904 .E327 1916 Leeming, John J. Burns Library, Boston College. Only days before Patrick Pearse read the Proclamation of the Irish Republic before the General Post Office, Lady Cunard, heiress to a shipping magnate’s fortunes, organized a staging of Yeats’s At the Hawk’s Well for wartime charities under the patronage of Queen Alexandra, who was present. In many ways Yeats’s own position could not be further from those who pulled triggers, concocted bombs, dressed wounds, and cooked meals under the Tricolour and the Plow and Stars. Yet in curious ways, Yeats experienced the Rising like many Dubliners, searching for information and building a narrative of the events. A steady stream of letters and news reports with their mixture of rumor, hearsay, and speculation reached Yeats, and as the leaders of the Rising one-by-one resigned their lives in the Kilmainham courtyard, the shifting narrative of the events and general disgust at Dublin’s destruction began to coalesce into sympathy, hagiography, and a new chapter in Ireland’s mythological struggle for freedom. The importance of Easter, 1916 can be found in its willingness to synthesize and interrogate this tectonic shift in sentiment, figuring a character like John McBride (estranged husband of Maude Gonne) as simultaneously a “vainglorious lout” and an indelible figure of the “terrible beauty” created by the event. 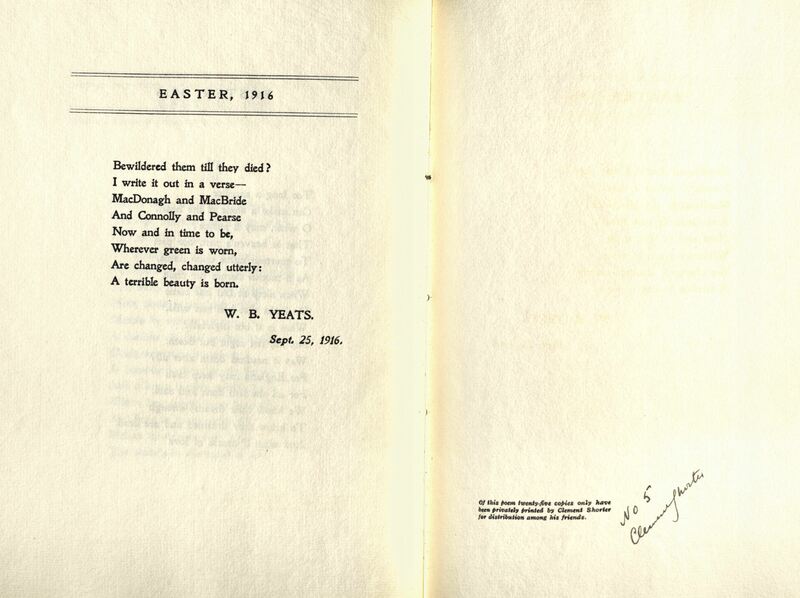 Last page and colophon of Easter, 1916 by W. B. Yeats, PR 5904 .E327 1916 Leeming, John J. Burns Library, Boston College. 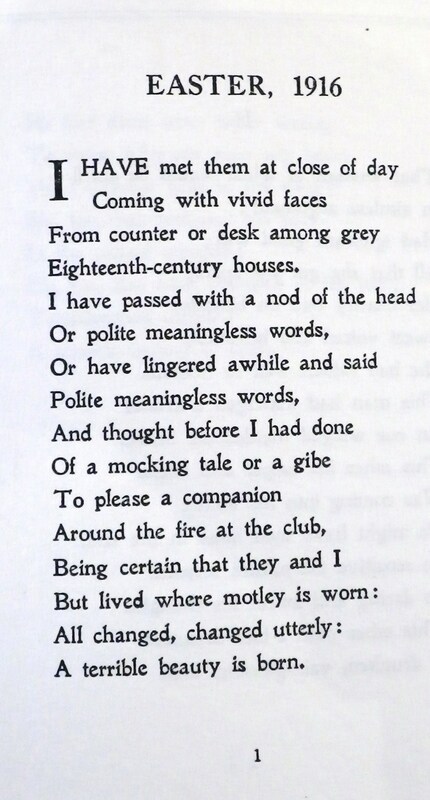 Initially, Yeats intended the poem’s striking personal and political content for a small audience. The poem was privately published by Clement Shorter in a print run of only twenty-five. Shorter, the husband of nationalist poet Dora Sigerson, was editor of The Illustrated London News and a friend of Yeats. The Burns Library owns one of these twenty-five initial printings that brought Yeats’s private thoughts on the Easter Rising to his closest friends and supporters before the poem entered into public circulation four years later when it appeared in both The New Statesman and The Dial as well as in the collection Michael Robartes and the Dancer (Cuala, 1921). This early issue of the poem offers a rare look into the poem’s development from private thought to public utterance and allows the reader to trace the changes made by Yeats. Andrew Kuhn, Burns Library Reading Room Student Assistant & Doctoral Candidate in the Department of English. This entry was posted in Featured Collections & Books, Fine Press, Irish Studies, Student Posts and tagged 1916, boston college burns blog, brian and june leeming, burns blog boston college, burns library blog, burns library blog boston college, easter, easter 1916, easter rising, ezra pound, irish history, irish literature, national poetry month, poetry, w. b. yeats, william butler yeats. Bookmark the permalink.